Butyric acid derivatives, also referred as butanoic acid, are salts and esters of butyric acid. Sodium butyrate is the major segment of butyric acid derivatives market. Salts of butyric acid include sodium butyrate, calcium butyrate, potassium butyrate, and magnesium butyrate. Of these, demand for sodium butyrate and calcium butyrate is substantially high. Butyric acid is a corrosive and foul smelling carboxylic acid; hence, it is usually converted into salts and esters for handling and application. Butyric acid derivatives are extensively used in animal feed application. Butyrate is known to improve gastrointestinal health, and prevent microbial infections and ailments in poultry, pigs, fish, and ruminants. Improvement in economic conditions and standard of living are expected to propel the global demand for meat. The animal feed segment is anticipated to significant significantly owing to the robust growth in poultry meat and pork production, especially in Asia Pacific, Europe, and North America. Furthermore, Europe is levying bans on the usage of antibiotics for animals in order to lower the threats posed by the misuse. Increase in substitution of these antibiotics by butyric acid and other organic acids is another key driver of the butyric acid derivatives market. 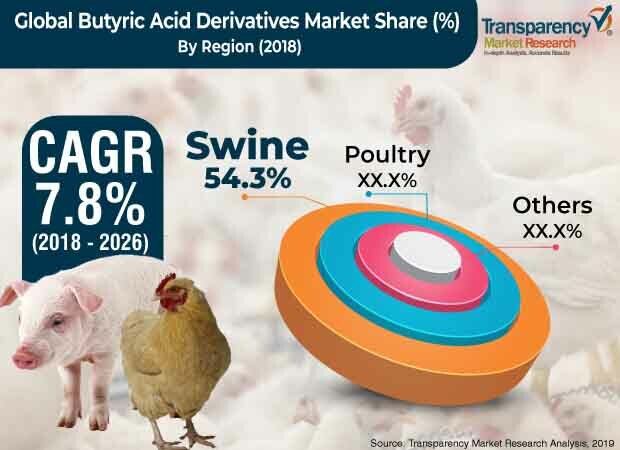 The swine segment held significant share of the animal feed segment of the global butyric acid derivatives market. However, the performance of the segment has been fluctuating from one region to another. The poultry segment held key share of the market in North America, Latin America, and Middle East & Africa. Butyric acid derivatives play a vital role in improving the animal gut health and weight. Sodium butyrate was the leading segment across all the regions. High effectiveness, better performance, low prices, and better solubility of sodium butyrate over calcium butyrate and other derivatives are key factors responsible for significant consumption of sodium butyrate. Sodium butyrate is widely used in varied proportions in animal feed for swine, chickens (layers and broilers), turkey, ducks, pigeons, etc. Rise in usage of sodium butyrate in animal feed due to their exceptional attributes is estimated to drive the global butyric acid derivatives market during the forecast period. Based on region, the global butyric acid derivatives market has been divided into North America, Europe, Asia Pacific, Latin America, and Middle East & Africa. In terms of value, Asia Pacific was the leading region of the global butyric acid derivatives market with more than 51% share in 2017. The region is one of the largest meat producers in the world. Countries such as China and India have substantial production of pork and poultry meat. Furthermore, China, ASEAN, and Japan are some of the largest producers of aquaculture in the world. Europe also holds major share of the butyric acid derivatives market. It is followed by North America. Rise in concerns over excessive use of antibiotics in animals and humans has led to the prohibition of antibiotics in Europe. Several countries in Europe have banned the use of antibiotics and antibiotic growth promoters to improve the meat yield from farm animals. This has created substantial opportunities for butyric acid derivatives to be used as substitutes for antibiotic growth promoters in the region. Key players operating in the global butyric acid derivatives market are Perstorp Holdings AB, Nutreco N.V., Koninklijke DSM N.V., Kemin Industries Inc., Bioscreen Technologies S.R.L, Innovad, and Palital GmbH & Co. KG.